One of the world's most famous faces has a look-alike brother! 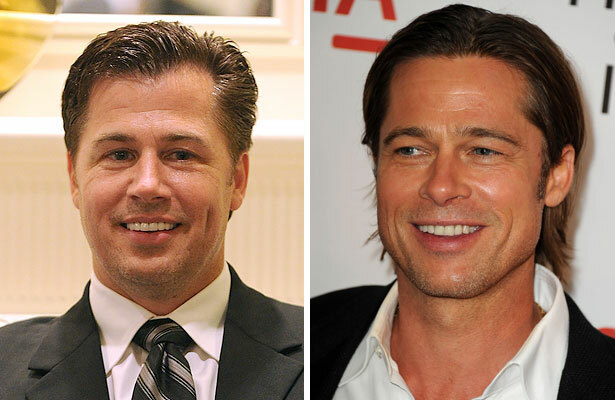 Brad Pitt's younger brother, Doug Pitt, said people definitely suspect he is related to his superstar brother, even putting his picture in the paper! Of a recent mistaken identity published, he says, "I wasn't even on that trip and it's posted all over... 'Brad's brother there,' so they're [paparazzi] not the brightest group." Just how often does he get asked if he is related to Brad? "Three times a week for the last twenty-something years," Doug explained. "I love him to death and couldn't be more proud, but my eyes kind of glaze over when I know it's coming." Doug, a photojournalist, shares his brother's humanitarian spirit, and teamed with Pres. Bill Clinton and Kevin Costner at the Starkey Hearing Foundation's 11th annual event "So the World May Hear" gala attended by 1,600 guests on Sunday in St. Paul, Minnesota. The foundation's mission is to provide the gift of hearing to those in need around the world and a "Listen Carefully" campaign was created to promote safe listening among young people. The 44-year-old reveals his father, William, always taught the Pitt children to give back, and "if someone was hurting, he [William] was there to take care of them." For more information on the Starkey Hearing Foundation, click here.